Electric tart burners are perfect for people who can’t have open flames in their homes. For example, I was at a friend’s apartment the other day and she uses an oxygen tank. She misses her candles, but at least she can still warm the wax in an electric burner. Students also might like them as they’re often forbidden to light candles in their rooms or apartments. 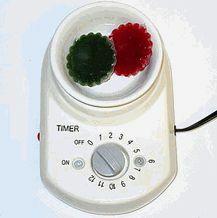 The electric tart burners with timers are even safer because they shut themselves off. This way, they don’t have to worry whether they’ll overheat the unit. Shown here is a simple electric tart burner/candle warmer that comes with a bowl. You could also warm your container candles or votives on this without the bowl. This particular burner has a setting for up to 12 hours if desired. See Tartburners.com for more information on this and other electric tart burners.